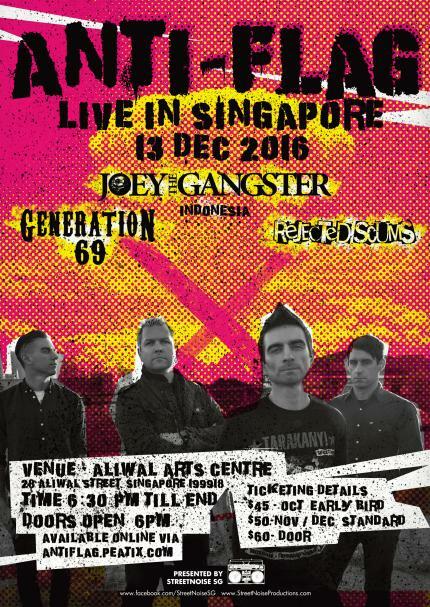 ANTI FLAG (USA) - Live in SG, 13th Dec 2016, Aliwal Arts Centre! Anti Flag was started up by Justin Sane and Pat Thetic in 1988 in Pittsburgh. Anti-Flag means anti-war. Anti-Flag means the common people of the world are better off living in unity and peace. Anti-Flag means to stand against corporate greed that hurts millions while benefiting a handful of extremely rich. Anti-Flag means to fight against mindless nationalism. Anti-Flag means unity. Come 13th December 2016, they will be touring Singapore for the 1st time ever! On this very much anticipated Singapore show, our local boys will also be part of the lineup!